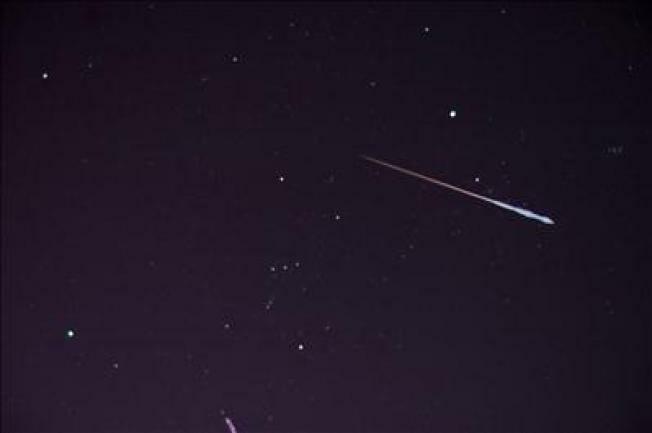 A meteor shower will be shooting across Bay Area skies early Sunday morning, although cloudy, rainy weather may diminish chances of a clear viewing, a local astronomer said. Weather permitting, Chabot Space and Science Center astronomer Ben Burress said the best time to see the Leonid meteor shower will be Sunday morning around 2 a.m. and 3 a.m.
Burress advised getting away from city lights and facing east to see the shower, which will have about 10 to 15 meteors shooting an hour. "For meteor showers we encourage people to find a darker place," he said. After near record setting heat this Week the weather pattern has taken another extreme turn with 2 storms in 48 hours. Details on both systems & what this means for your Weekend in Chief Meteorologist Jeff Ranieri's forecast. Leonids has a strong showing every 33 years, the astronomer said, with this year not expected to be as remarkable as past years. "It's on the quieter side as far as showers go," Burress said. The shower is named after the constellation it appears to coming from -- in this case, Leo, which depicts a lion. The Leonids are associated with the comet Tempel-Tuttle, which was discovered in the 1860s. Meteor showers happen when Earth travels through a trail of dust left behind by a comet, Burress explained.